The local news media in Detroit has not done an adequate job of detailing all of the actual numbers for violent crime in Detroit for 2013. Apparently, the official narrative is that homicides are down, as well as all of the other crime categories. The actual numbers for each time of crime isn't really necessary. So, I called the Public Information Office of the Detroit Police Department and got the final figure for carjackings in 2013 for Detroit - 703. In other words, almost 2 people are forcibly removed by force from their vehicles every day in this town. Yes, it seems high but figures don't lie. They are what they are. 1. Always be aware, especially at convenience stores, parking lots, and gas stations. 2. Always leave yourself a way out of your current location. 3. Always keep your vehicle's doors locked upon entry. 4. Always keep your vehicle's windows rolled up. 5. Don't "Stand" in a non-running vehicle. 6. Don't waste time entering and exiting a car your vehicle. 7. Legally carry an accessible and loaded pistol with a Concealed Pistol License. 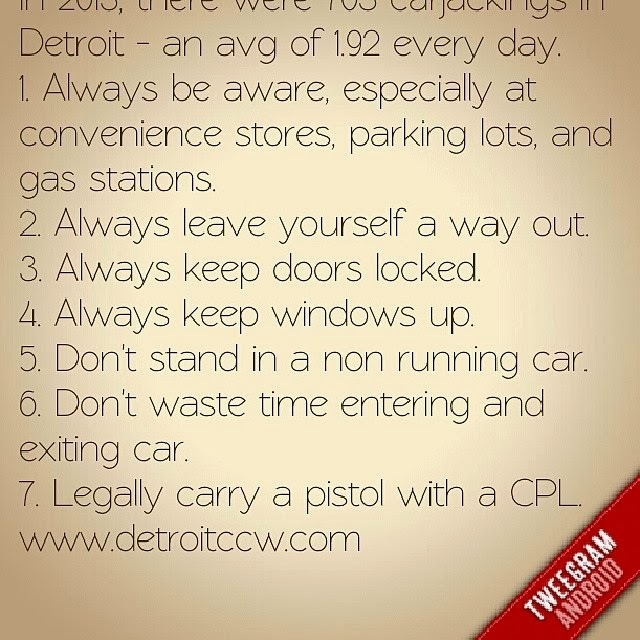 Comment and let me know if you have some carjacking prevention tips not listed!